The steel cantilever truss shown below is composed of 117 members and 30 nodes. Sizing and shape optimization of this three-dimensional truss structure is considered. The topology (i.e. the way that the nodes are connected to each other) for the truss is assumed to be fixed. The structure is designed under three independent load cases, where the loads are applied at all unsupported nodes of the truss in the following cases: (i) horizontal loads of 15 kN applied in positive x-direction, (ii) horizontal loads of 15 kN applied in positive y-direction, (iii) vertical loads of 15 kN applied in negative z-direction. The displacements of all nodes in x, y, and z directions are limited to a maximum value of ± 4.0 cm. The material density, elastic modulus, and yield stress are 7.85 ton/m3, 200 GPa and 248.2 MPa, respectively. The structure is designed in accordance with the regulations of AISC-LRFD 1994. To this end, each member is checked considering the limit states of tensile yielding and compressive buckling. A simple MATLAB function for the structural analysis and design of this particular truss is provided below. Find the sizing variables (S1 to S117) as well as shape variables (z1, z2, z3, z4, z5, z6, z7) which minimize the weight of the structure according to the given constraints. However, the maximum number of objective function evaluations that you are allowed to perform, using the given MATLAB function, is 20000 times. In other words, you are only allowed to call the given MATLAB function 20000 times (maximum) during your optimization process. Note that, structural analysis and design shall be performed using the given MATLAB function only. You can use any optimization technique. Further, you may propose a new optimization algorithm or a hybrid form of previously proposed algorithms. However, using commercial optimization software is not allowed and the participants must prepare their own original codes. The optimization process shall always start from a random point in the design space. In other words, the initial 124 design variables of your optimization procedure must be selected randomly. The sizing variables (S1 to S117) can only take integer values ranging from 1 through 37 (including both 1 and 37). Each sizing variable represents a section ID from the following database of 37 pipe sections. For the shape variables (z1, z2, z3, z4, z5, z6, z7), use discrete integer values only. The lower and upper bounds on the shape variables are 1000 and 3500 mm, respectively. Thus, you can select the shape variables as integer values ranging from 1000 to 3500 mm. The final optimum design must be feasible (i.e. no constraint violation is allowed). 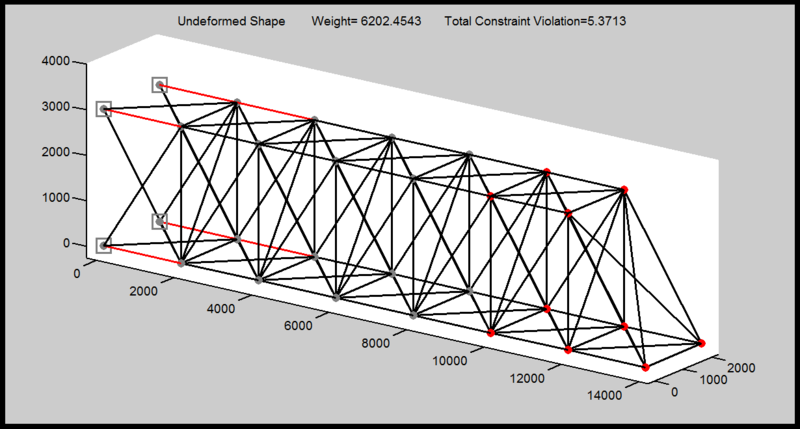 The amount of constraint violation associated with your proposed design is also reported by the structural analysis and design MATLAB function, given below. Grouping of the design variables is not allowed neither at the beginning of the optimization process nor in the course of optimization. For the sake of conformity, please solve the problem in the given units. Submit your code, the final optimum design with all 124 design variables, and a brief description of your optimization approach in a single PDF before the deadline. “Sections” is a row vector (size 1×117) which contains the sizing variables S1 to S117. “Coordinates” is a row vector (size 1×7) containing the shape variables (z1, z2, z3, z4, z5, z6, z7). “Flag” is either 0 or 1. The value of zero indicates that no graphical output is requested from the function. On the other hand, if Flag is set to 1, the function will plot the undeformed geometry of the proposed truss structure. In addition, the nodes that violate the displacement constraints and the members that violate the stress constraints are colored in red. This is further discussed below. “Weight” is the net weight of the proposed structure. “Const_Vio_Stress” is the relative amount of constraint violation based on the stress constraints. If a value of zero is reported by the function it means that all of the truss members satisfy the stress requirements. Any value larger than zero indicates that one or more truss members has not satisfied the design regulations of AISC-LRFD 1994. “Const_Vio_Disp” is the relative amount of constraint violation based on the displacement constraints. If a value of zero is reported by the function it means that the displacement of all nodes is in the allowable range of ± 4.0 cm. Any value larger than zero indicates that the displacement of one or more nodes has violated this limit. The nodes and members that are colored in red represent nodes and members which violate the displacement and stress constraints, respectively. At the top of the figure, weight of the proposed structure, as well as the total constraint violation (i.e. sum of “Const_Vio_Stress” and “Const_Vio_Disp” values) are displayed. The winner of ISCSO 2016 is Muhammad Firmansyah Kasim from the University of Oxford, United Kingdom. You may find further information about the winner and the reported optimum design here.